MC: 1.12 - The World of Color Update! Concrete Powder (colored sand?) and Concrete that are going to totally screw up our custom Texture Pack! Plus a bunch of other stuff, of course. The Recipe Book is pretty great, and will come in quite handy creating mass quantities of blocks or especially when you just can't remember that recipe. When is this version out? That is a lot of color for sure! I'm still kinda swamped most evenings, but I'm trying to find time to poke around in here and update our resource pack. The quality of this board depends on the quality of the posts. The only way to guarantee thoughtful, informative discussion is to write thoughtful, informative posts. AppleNova is not a real-time chat forum. You have time to compose messages and edit them before and after posting. It is out! How about that. I installed it on a test server so I could make parrots and kill them. They make a boring death sound. Concrete is fun to make. Make a endless watering hole that is 1 x 3 wide and put the concrete powder in the middle spot as tall as you can. I did it at a beach so I could jump into the ocean and live. Then stand in one of the spots and harvest the solid concrete one block at a time. MineCraft? mc.applenova.com | Visit us! | Maybe someday I'll proof read, until then deal with it. Perhaps we should trim again. Edit: With the current work at over 5GB total we don't have enough room to duplicate the 1.11 world into the newly created 1.12.x-vanilla folder. I did put the new jar in it in case you wanted to play with that one Brad. I'm going to look into expanding the volume in hopes of being able to have more room to play with in that machine. Last edited by turtle : 2017-06-08 at 21:29. I don't care either way. I need to focus on building, not flying. I wonder if we just keep the same seed and trim this world if we even need a map backup. I'm happy enough with this seed. Maybe just trim everything past a larger square to keep some of the upgraded villages and the NSEW towers? Would you point me in the direction of these NSEW towers? The world is so huge now that I can't find anything. I'll dig out my old grid template to try to get a feel for what the latest trimmed world will look like. Also, concrete! By jove, it looks like Mojang finally provided some bright mostly-flat textures that actually look pretty good. That's wool, concrete powder, powder, and terracotta from bottom to top in each color using my texture pack just for the wools and terracottas. I'm overall impartial about what get trimmed beyond our original trim for 1.11. While I like some of the villages I improved and such, it might be fun to find more and redo them. I'd more lean toward keeping the Masions, but then again...new ones should spawn. I'll have no matter what! Also, while we're sorting out world trims and server upgrades, anyone interested in taking another new-world romp in a blank 1.12 seed for a little bit? I just need a few more minor tweaks before my resource pack is back up to snuff for 1.12. Once it's "not broken", though, I'm sure I'll be fighting the color palette for a while to perfect concrete vs terracotta. I'm all for it. This weekend might be rough for me. It's possible I could do some fun tomorrow night though. Would you point me in the direction of these NSEW towers? The concrete colors vs. the texture pack terracotta colors already look great! I was afraid the concrete was going to negate the work that you did on the stained clay, but there's definitely enough of a difference that I could choose one over the other. This is what the world would look with a "core" expansion plus the cardinal direction towers and previously kept regions. Thoughts? I'm fine with the pruning. I'll find new villages to build up and improve. Speaking of villages, I'm also planning to nuke some of the not-chunk data files that remember when villages, ocean monuments, etc. are generated. Hopefully that will result in trimmed villages being appropriately repopulated when the chunks are explored again "for the first time". IIRC, regenerated villages have typically been deserted after chunk trims. This should fix that. The only gotcha is that this may ruin any existing ocean monuments within the chunks we don't delete, keeping them from spawning baddies. I can make an exception for the monument trap in the northeast. Are there any others around worth trying to preserve? If we're keeping the same seed I'd want the NW and SW tower chunks saved, but other than that the trim looks good to me. One other monument area I'd like the baddies to be preserved in is the chunk directly E of the museum. The monument is cleared and the fatties are killed, but I do like that it's a danger still. There's also one in the W tower chunk that might be fun to keep if it's not too much trouble. If it is, no biggie. So, uhh, hi guys, how's it going? Some people have the nerve to show up after what? 40 years? Been busy at work, smashed my car, got my wife pregnant. Been difficult to find time for Minecraft. You know, they've figured out what causes that. Helped run a speedrunning marathon for charity. Been doing the streaming thing regularly otherwise. Only MC I've played recently is modded. Nice to see you stop by again ThunderPoit! Sounds like you've been having a blast. I'm looking forward to the update just for the general update. The recipe book in the crafting area is nice, lets you know what you can build from your inventory even if you have to craft something first. Like log will show sticks even though you can't get sticks directly from the log. That way we grab the remaining towers (+) and it leaves a nice edge if we do decide to go for a different seed after the trim. Ya? Also, forget about my request to retain the zappy-fish near the towers. Being struck with the Mining Curse is a pain. If not too much effort I'd like to request keeping the zappy fish in the SE block of my 4 block area out west. Since we're talking updates and trimming, I have a grumble. No one is at fault, because it didn't get thought of and I didn't catch it. The area immediately south of my squid spawner is suddenly ocean, due to some happenings or other with the last trim. When I built the trap, I had to find an area where I could easily (relatively) remove all water within 128 blocks of the trap's center. Otherwise, squid will not spawn. I had to dam the river and sponge it out, hunt the beneath for water ponds and falls, fill any ponds on the surface, etc. I went out there, today, to remove the old coffer dams and discovered the giant cliffs of Jeb and the ocean immediately to the south. The trap no longer works because of this close proximity to water. When we trim, I would like to request some kind of fix for this, since there is no practical way to fill the ocean in. Since November 2016, I have tried to live my life without politics or football, and it has been the most peaceful time of my life. 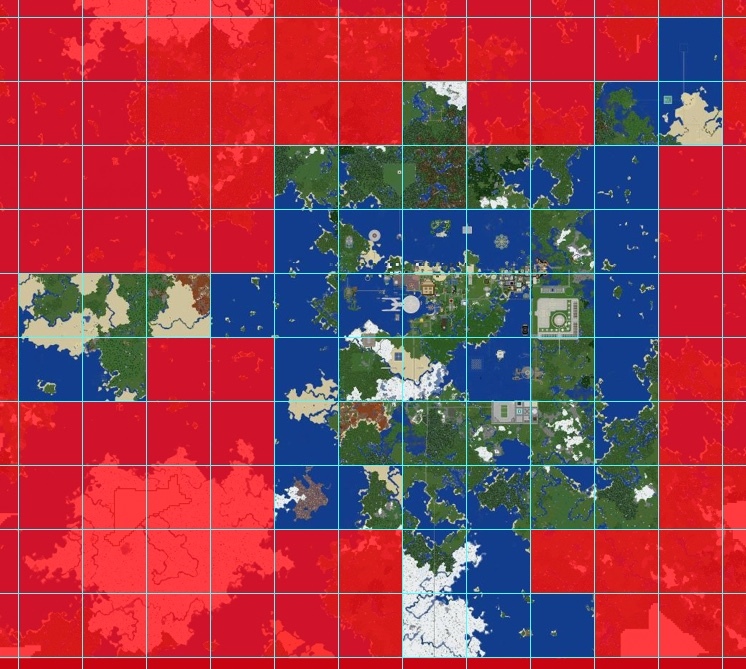 If we trim with a new 1.12 seed that should fix it – as long as the new seed isn't ocean in that sector. I'll help with water fill-in/removal to get the ink farm back up to speed. Speaking of.... 1.12 seems pretty solid, is there a reason we can't just update to 1.12 now and trim later? I get that ideally we'd trim and start a new world on the outside, but maybe that's not an option right now. Brad's texture pack looks great and I'm itching for some weird colored sand and glazed terracotta. 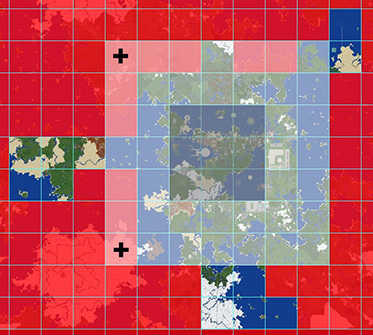 If the new seed brings land, filling in the various rivers, ponds, and hidden-underground puddles is a pretty big undertaking (witness the old coffer dams—which are gone, now). If it is ocean, it represents something like 100,000 blocks of water to deal with, which is a monumental task. Building a new trap elsewhere would be less work. All times are GMT -5. The time now is 22:24.